Two people were hospitalised with head injuries after a tree fell on their car while they were driving, as emergency services responded to hundreds of storm related calls. 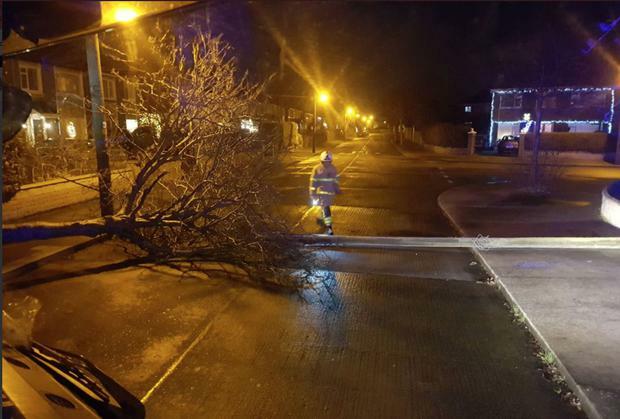 The incident happened shortly after 7.30pm last night in Virginia, Co Cavan, as Storm Eleanor wreaked havoc from west to east. According to a the Dublin Fire Brigade (DFB), which received the call, the pair were trapped inside the car before paramedics from the HSE’s National Ambulance Service were able to rescue them. They were taken to Cavan General Hospital with head injuries, he said. The call was one of close to 1,200 the DFB received in the 48-hour period from New Years Day in which it logged hundreds of calls for ambulances and storm-related calls due to downed trees and other hazards. “It was mayhem,” a DFB official said. “We were busier than during Hurricane Ophelia,” he said.